J.P. Morgan Chase spends almost $600 million on cyberdefenses, according to CEO Jamie Dimon’s annual letter to shareholders. “The threat of cyber security may very well be the biggest threat to the U.S. financial system,” Dimon says. The risk of a devastating cyberattack may be the single greatest danger to the U.S. financial system, according to J.P. Morgan Chase CEO Jamie Dimon. J.P. Morgan spends almost $600 million annually to tighten its defenses and ward off a constant stream of attacks, Dimon said Thursday in his annual letter to shareholders. But the interconnected nature of the financial system means the risk never goes away. Indeed, J.P. Morgan was the victim of a large data breach in 2014 tied to hackers. “The threat of cyber security may very well be the biggest threat to the U.S. financial system,” Dimon said. In last year’s letter, Dimon called cybersecurity an “arms race” that was critical for the financial industry, as well as for sectors including utilities and tech firms. He also called for improvements to the local and international regulatory framework tied to cyber risk. If you have an account with Microsoft Outlook email service, there is a possibility that your account information has been compromised by an unknown hacker or group of hackers, Microsoft confirmed The Hacker News. Yesterday, a user on Reddit publicly posted a screenshot of an email which he received from Microsoft warning that unknown attackers were able to access some information of his OutLook account between 1 January 2019 and 28 March 2019. Another user on Reddit also confirmed that he/she too received the same email from Microsoft. 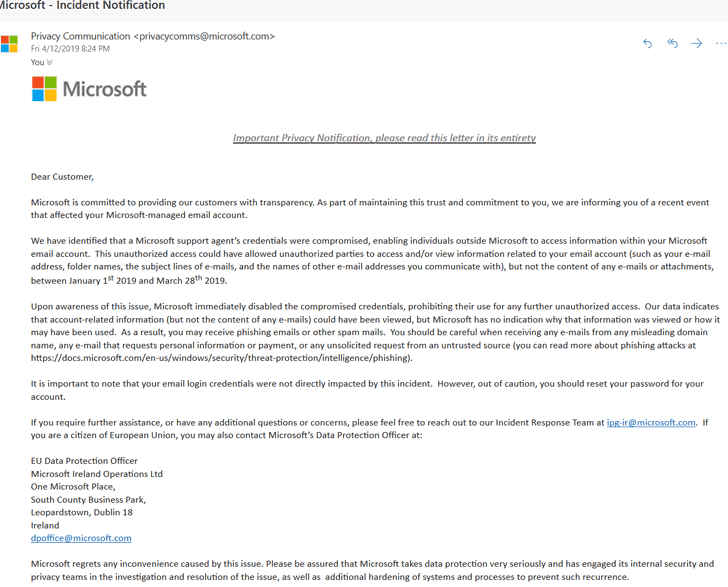 According to the incident notification email, as shown below, attackers were able to compromise credentials for one of Microsoft’s customer support agents and used it to unauthorisedly access some information related to the affected accounts, but not the content of the emails or attachments. The information that a Microsoft’s customer support agent can view is limited to account email addresses, folder names, subject lines of emails, and the name of other email addresses you communicate with. It urges IT teams to follow best practices in cybersecurity including keeping systems and AV tools up-to-date and patched, disabling file and printer sharing, enforcing strong passwords, restricting user permissions, scanning for suspicious email attachments and more. One of the most successful phishing methods is to co-opt a well-respected brand. PayPal topped the list by a wide margin in a recent analysis of over 100 million endpoints by Comodo Threat Intelligence Lab. 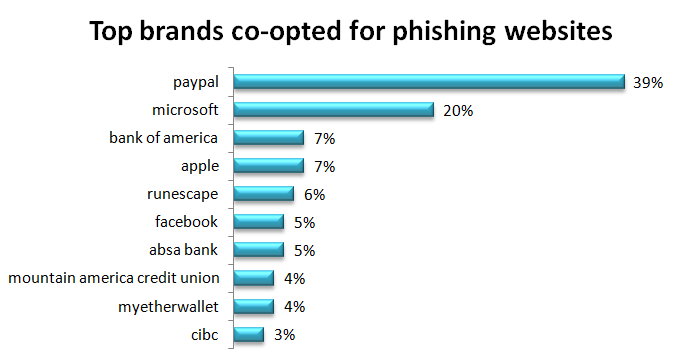 PayPal was impersonated in 39% of all such attacks, with Microsoft a distant second at 20%. Sharing this information is important so that your users know to be more vigilant if they get an email or alert, supposedly from PayPal, Microsoft, or the others in this chart. Some of these phishing websites look quite authentic and may fool even security-minded users. This type of information is a great addition to your security awareness program. The scale at which these attacks are being deployed is evident in the number of web pages using this type of attack. This analysis discovered 61,767 web pages impersonating these brands for the purpose of phishing. Just over half were taken down by the time this article was written. That still leaves almost 30,000 malicious web pages to lure your users. Brands that have hundreds of thousands of registered user accounts are an inviting target for cybercriminals. Consider, for example, PayPal with 267 million registered user accounts. If an attacker can send phishing emails to 1% of them, that’s 2.67 million chances that a user will click on a link that brings that user to their malicious website. If just 1% of those users click that link, they get 26,700 accounts that they have compromised. When dealing with a trusted brand, people tend to let their guard down. If a phishing website impersonates a trusted brand well enough, that lower level of user vigilance increases the chances of a successful attack. In most cases, this is the ultimate goal. There are other motivations such as hacktivism or cyber warfare. Now, FIN6 – or at least some members associated with cybercriminal gang – have begun to switch tactics, deploying ransomware throughout the networks that they are attacking, FireEye researchers note in a blog. One strain of ransomware that FIN6 is using, according to FireEye, is Ryuk, which was used against the Chicago-based Tribune Publishing company in late 2018. The other is Lockergoga, the ransomware used against the Norwegian firm Norsk Hydro in March, causing at least $40,000 in financial damage. It’s also suspected in other attacks in Europe and the U.S., according to security researchers. According to the PoC, researchers built a man-in-the-middle device to use the method of attack that penetration testers demonstrated in a hospital. The researchers gained access to the radiologist’s workstation and the CT scanner room after the cleaning staff opened the door for them. In a matter of 30 seconds, they installed a device running a fake malware designed to inject or remove images. Once installed, the attackers returned to the waiting room, where they had remote wireless access and were able to intercept and manipulate CT scans, which were not encrypted. Kaspersky Labs researchers witnessed the malware starting to make rounds during that country’s 2018 election and found the malware has credential stealing, keylogging, screen recording, SMS interception, payment card and financial information stealing features, according to an April 4, blog post.